Tenri Seminary, which nurtures human resources that will serve as the core for the future of the path, held its graduation ceremony on March 9 with the Shinbashira and Successor-Designate Daisuke Nakayama in attendance in East Right Wing 1 of the Oyasato-yakata building-complex. Tenri Seminary, since its establishment in 1900, has consistently produced graduates that play a main role at the forefront of missionary activities. This year, there were a total of 109 graduates: Graduate Seminary research program, 6; Graduate Seminary practical training program, 19; and Junior Seminary, 84. On this day, the young graduates took to heart the congratulatory address delivered by the Shinbashira as they left the school with a new pledge for single-hearted salvation. Following the opening prayers and the singing of the Yorozuyo, Principal Zenpei Kubo presented the diplomas to the representative of each graduating class. Then the Shinbashira gave an address. After congratulating the graduates, the Shinbashira talked about the purpose of Tenri Seminary, which was established as Tenrikyo’s first school to nurture human resources who would shoulder the path. He went on to say that the fact that they studied the teachings and cultivated their faith through engaging in hinokishin and missionary work as students of this school, meant that they were educated and trained right by God the Parent and Oyasama’s side, while sowing seeds of sincerity for the future. 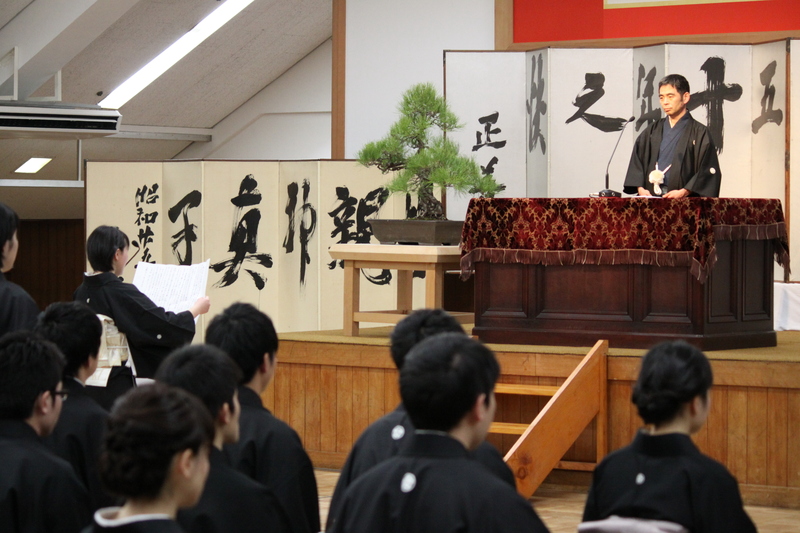 The Shinbashira closed his address by expressing his hopes that the seminary graduates would follow the path in a befitting manner and achieve even greater spiritual growth that would enable them to serve admirably as instruments of Oyasama. Later, a representative of the Graduate Seminary research program graduates expressed appreciation for the advice the Shinbashira had given them in his address. That was followed by a pledge by two graduates from the Graduate Seminary practical training program and the Junior Seminary. Following the ceremony, a commemorative picture was taken with the Shinbashira and Successor-Designate Daisuke Nakayama in the center. Later the graduates went to the Main Sanctuary for an appreciation service. Among others, 30 of the graduates now work as staff members at facilities in the Home of the Parent including Tenrikyo Administrative Headquarters; 50 serve at churches, followers dormitories, and overseas mission headquarters; 11 study in Tenri Graduate Seminary’s practical training program; and 3 live at missionary houses.